They are not just grandma’s bedcoverings. Traditional quilting has become a 3.6 billion dollar industry and contemporary quilting holds the status of a fine art. More surprisingly, these fabric-based pieces can also be brashly political. 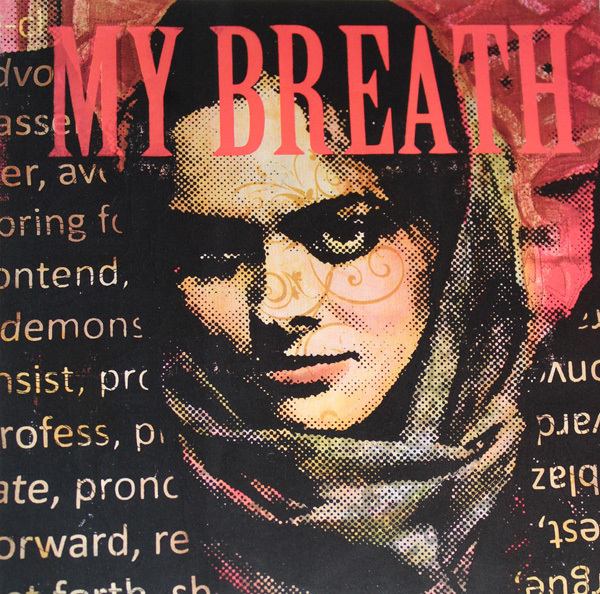 Carol Coohey’s My Breath Coming Out Of Your Chest places anti-government protestor Neda Agha-Soltan at the center of her quilt. The bullet holes around her image evoke the horror of this Iranian woman’s murder. Mary Pal’s Solace uses cheesecloth to create the intricate faces of two homeless men and Linda Colsh’s Twilight stiches an elderly woman walking through the icy streets wearing only a red sweater and slippers. These are some of the provocative quilts presented in Brainstorms: Quilt Visions 2012 at the Vision’s Art Museum. Judges selected forty quilts out of 394 entries to their biennial contemporary quilt competition. Twenty-five quilters attended the opening festivities and talked about their work to a packed house during the Sunday morning Walk and Talk. The exhibit continues until February 17, 2013. You might think quilts are simply squares of patterns, but Barbara Lange’s Monochrom V-Quest is an edgy yellow spiral of stiches that culminates in a large bee, reminding us that these insects are dying out. Mary Buchanan uses her experience with the memory impaired to create a quilt with disappearing words and letters. Viviana Lombrozo stitches an alphabet she has created herself. San Diego is one of the few quilting meccas in the country, explains Beth Smith, Executive Director of the museum. The exhibition this year is especially significant because quilters finally have their own museum space. In 1985 San Diego quilters came together to form a group that soon incorporated. They held their first exhibition in Fallbrook. Throughout the 1990’s they held a biennial competition and displayed their winning pieces at the San Diego History Center in Balboa Park, but in 2000 when renovations to the building began, the quilters needed to find a new home. In 2002, the group, which had grown to about 600 members that divided into 12-15 quilting guilds, exhibited their work in Oceanside. Then, five years ago, the quilters found a home at Liberty Station. The architect of the space, Robert Leathers, is also a quilter whose Kings Canyon featured in this year’s exhibit. He explained that his quilt tries to engage the viewer through ambiguity. The viewer then wants to look more deeply and this is true art. Color, texture and light all play important roles in the quilts. In Time Crumbles ThingsTerri Shinn creates a triptych of items that decay: metal hardware, automotive padding and shingles. Leesa Zarinelli Gawlik uses her seventeen years living in Japan and Italy to present a meditative Japanese rock garden contrasted against a high-energy zigzag stitch. Micropolis artist and Bleecker resident Judith Plotner tells us she is one of 40 artists from around the globe represented at Visions Art Museum in San Diego, Calif., through February 17th. 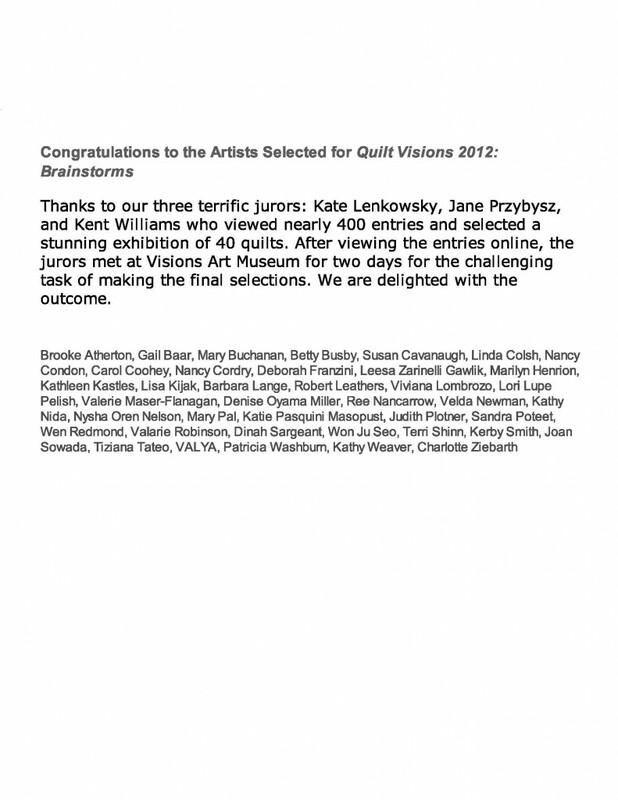 The show, “Quilt Visions 2012: Brainstorms,” is the latest edition of an international biennial competition that has drawn crowds since 1987. Three jurors were challenged to select an exhibition that represents outstanding design and technique from 394 entries. They have selected 40 outstanding works of art from 17 states and five foreign countries created in the last two years. The jurors were Kate Lenkowsky, author of the award-winning book “Contemporary Quilt Art: An Introduction and Guide”; Jane Przybysz, former executive director of the San Jose Museum of Quilts & Textiles, currently executive director of the McKissick Museum of the University of South Carolina-Columbia; and Kent Williams, an award-winning contemporary quilter whose work has appeared in numerous juried exhibitions, including previous “Quilt Visions” shows. This year, the 12th “Quilt Visions” exhibition will be presented for the first time at the “Visions Art Museum: Contemporary Quilts + Textiles” at Liberty Station in San Diego. Visions Art Museum will welcome thousands of visitors from around the world and throughout the U.S.
Snohomish Artist Terri Shinn is among the 40 Artists from around the globe whose work was juried into the Visions Art Museum in San Diego beginning Oct. 20 for the premier of Quilt Visions 2012: Brainstorms, the latest edition of an international biennial competition. 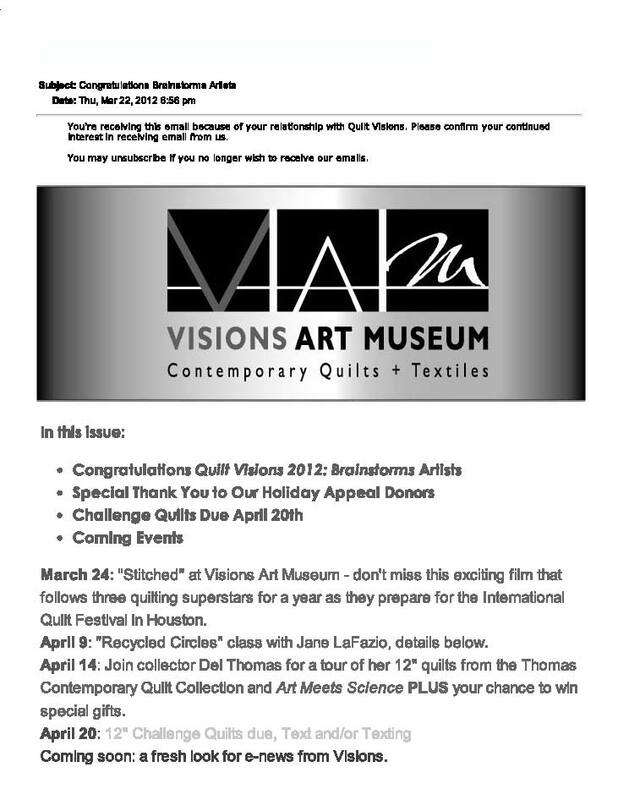 This year the 12th Quilt Visions exhibition will be presented at the Visions Art Museum: Contemporary Quilts + Textiles at Liberty Station in San Diego,CA. From the opening weekend festivities beginning Oct. 20 to the close on Feb. 17, 2013 Visions Art Museum will welcome thousands of visitors from around the world. Shinn, who in 2005 was named Snohomish County’s Artist of the Year, will exhibit “Time crumbles things” a 56″x 18 three-dimensional mixed media wall that takes its name from an Aristotle quote. Born in Idaho, Shinn comes from a long line of quilters who helped shape and influence her passion for textiles. Her journey continued in Alaska, where she was awarded “Juror’s Choice” at the Earth, Fire and Fiber Show at the Anchorage Museum of Fine Arts in 1989. That year she was commissioned by the Anchorage Zoo to work with Annabelle the elephant. Annabelle painted fabrics that Shinn used to create quilts for the zoo to auction at a benefit event. Since that time, Shinn’s artwork and techniques have continued to evolve. Now living in Washington, her work has been featured in numerous books, regional and national shows, and included in private and public collections. Shinn is currently enrolled in a multi-year certificated program in Experimental Stitch and Multimedia at the Gail Harker Center for Creative Arts located in La Conner, WA. 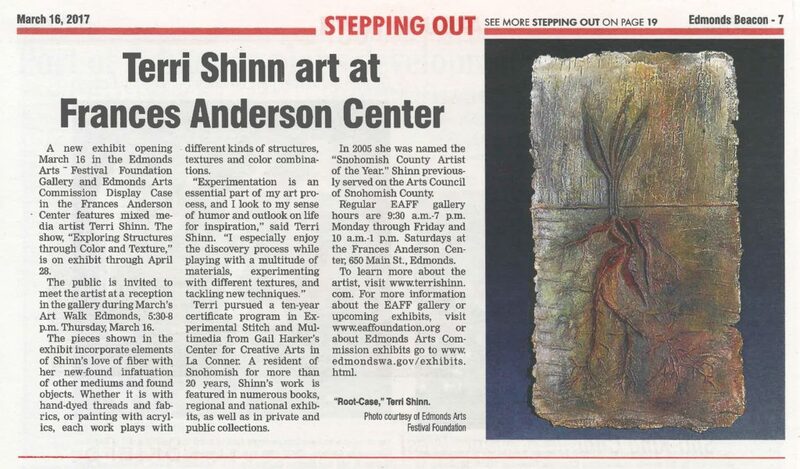 Shinn was one of 40 artists chosen from 390 entries for the exhibit by three jurors. Exhibit jurors were Kate Lenkowsky, author of the award-winning book, Contemporary Quilt Art: An Introduction and Guide; Jane Przybysz, former executive director of the San Jose Museum of Quilts & Textiles, currently executive director of the McKissick Museum of the University of South Carolina, Columbia; and Kent Williams an award winning contemporary quilter whose work has appeared in numerous juried exhibitions. A Meet the Artists Opening Reception on Oct. 20 from 5:00 p.m. to 7:00 p.m. $5, Visions members free. A Tour with the Artists at 11:00 a.m. Oct. 21 where the artists will talk about their work during a tour, $15, Visions members $10. On October 21st moderator Judith Content will lead a panel discussion with four Brainstorms artists including Shinn, titled, “The Artistic Journey” at 2:00 p.m. $15, Visions members $10. A 100-page color catalog of the exhibition will be available for sale in the Visions Store. For more information about the Exhibit, visit the website, www.visionsartmuseum.org or call 619-546-4872. 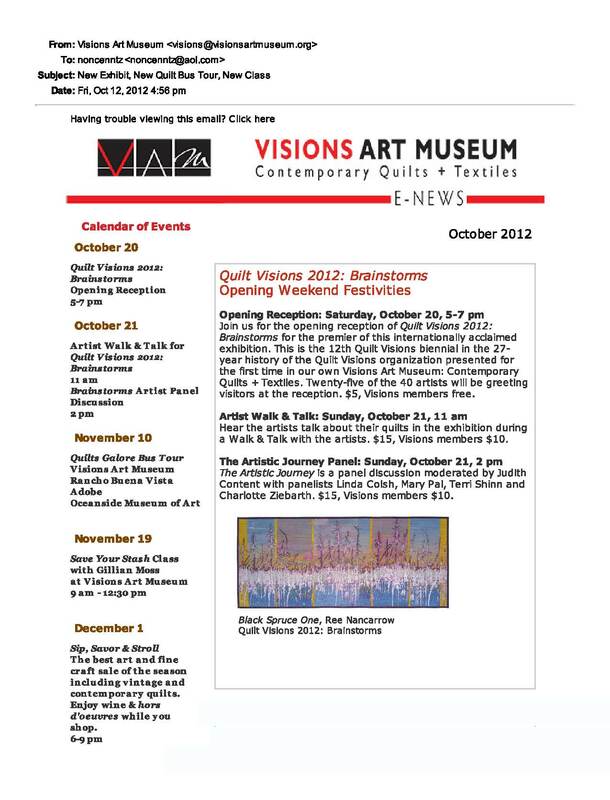 Visions Art Museum: Contemporary Quilts + Textiles is located at 2825 Dewey Road in Liberty Station,San Diego,California. Museum hours are 10:00 a.m. to 4:00 p.m. Tuesday through Sunday, closed Mondays and major holidays. Admission is $5, children age 12 and under are free when accompanied by an adult.Visions Art Museum members enjoy year-round complimentary admission.